Do lower tax rates produce higher economic growth? The evidence in favor of this theory has always been thin, especially when tax rates are fairly modest, as they are in the United States. Everyone agrees that taxes produce deadweight losses, but those losses are fairly small and are often offset by the benefits that a strong central government provides to an economy. When you net everything out, low tax rates don’t seem to have a big effect. 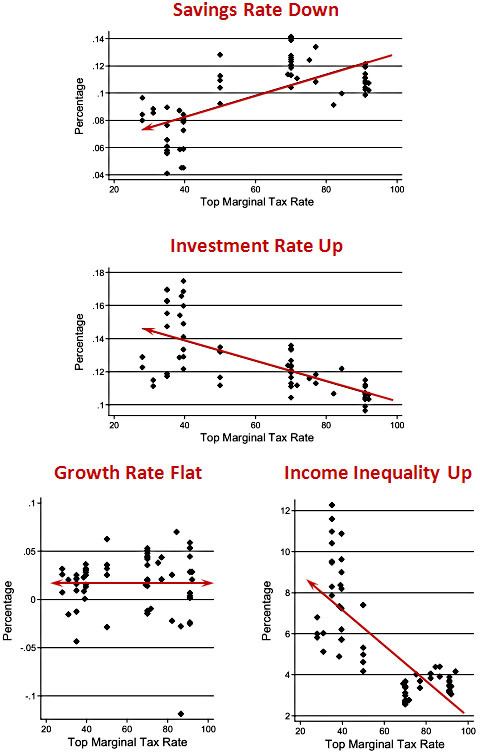 None of these three results were statistically significant, but a fourth result was: lower top marginal tax rates mostly benefit the rich, leading to much higher income inequality. The study found similar results for capital gains tax rates. All the charts are below and the full study is here. One caveat: Generally speaking, marginal tax rates were high from 1945-1980 and low from 1980-2010. So the CRS results might just be an artifact of the fact that growth was higher during the postwar period and lower during the post-Bretton Woods era. In other words, it might have nothing to do with tax rates. But of course, that’s the point. Nobody thinks that raising taxes is actively good for the economy, except to the extent that it helps balance the federal budget. The question is whether there’s any evidence that lowering taxes boosts economic growth. And there really doesn’t seem to be.